Widdrington schoolgirl Amy Stokoe was at Hillhead in Edinburgh last weekend, competing in the Scottish Skiing Dryslope Alpine Championships. This was a two-day event and Amy was first in the slalom under 12 female category on Saturday, and second in the giant slalom under 12 females on Sunday. This was a tremendous result, with two podiums over the two days, as there were 147 racers from across Scotland and four from the Silksworth slope in Sunderland. Earlier in the summer season, in July, Amy finished in second place for under 12 females in the Northern Open held at Silksworth. Amy has recently had successes on snow indoors. She was third in the Anglo-Welsh Championships in August at Chill Factore and third in the British Indoor Championships, also at Chill Factore, Manchester. 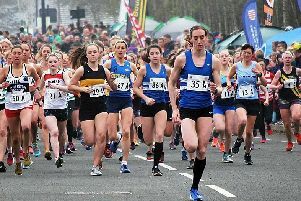 Amy was also placed third in the GBR Indoor Race Series this summer, having attended a series of races in snowdomes across Scotland and England. Earlier in the summer Amy competed in her first Skier Cross competition at Castleford and was second. She also trained in Landgraaf, Holland, for four days on snow in the second largest Snowdome in the world with Tigers Ski Club. Amy has just been awarded sponsorship from Everyone Active leisure services.